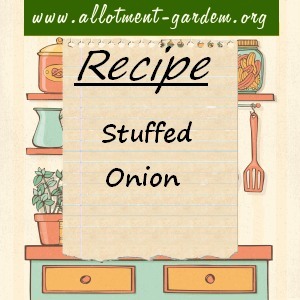 Yummy if you’re addicted to onions like me! Peel of the outer leaves of the onions carefully to retain their shape. Cut a slice of the top of each and make a few gashes around the onions. Pierce each onion through the centre with a large fork. Put the onions into a large wide pan of boiling water and cooks until just tender. Drain, cool slightly and then carefully push out the centres. Heat the oil in a frying pan and add the finely chopped celery, garlic, sage and parsley. Cook for about 5 minutes and then add the breadcrumbs, salt, pepper and grated cheese. Cook this mixture for 2-3 minutes, mixing well into a paste. Stuff the paste into the onions. Grease a baking dish with butter and transfer the onions into it. Top each onion with a sliver of butter. Bake in a pre-heated oven at Gas Mark 7 (425°F/220°C) for 30-45 minutes.